Open Class: Brass: Oregon Crusaders (18.50), August 6, Erie, PA Percussion: Blue Devils B (19.10), August 6, Erie, PA Color Guard: Spartans (18.70), August 6, Erie, PA View all scores and recaps. • In the Open Class, Oregon Crusaders caught up to Blue Devils B and came out on top in Erie, PA on August 6, scoring 92.35 to BDB's 91.65. The win ended BDB's impressive undefeated streak of 19 shows that stretched back to July 17, 2010. A few hundred miles to the west, Vanguard Cadets scored 91.60 in Dubuque, IA, meaning there is no clear and undisputed leader heading into the Open Class World Championship in Michigan City, IN. • The DCI Eastern Classic in Allentown saw Blue Devils come out on top of the Cadets by just 0.05, with the Cavaliers down just 0.40 to BD. Carolina Crown was down 1.55 from BD with a new ending that has yet to be tweaked. 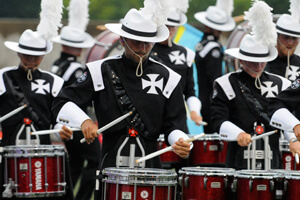 With Cadets topping BD by just 0.15 at the Tour of Champions show the next night and Crown closing the gap on the Cavaliers from 1.15 in Allentown to 0.75 in East Rutherford, NJ, the World Class Prelims in Indianapolis should be among the most anticipated match-ups ever. • The Saturday version of the DCI Eastern Classic marked the first time this season that any corps broke 95.00, with both Cadets and Blue Devils now in that exclusive scoring territory. Santa Clara Vanguard and Bluecoats both broke 90.00 this past week, and Blue Stars and Glassmen broke 85.00. Colts, the Academy and Crossmen all passed by 80.00. • Prior to the Erie event on Aug. 6, Blue Devils B had beaten Oregon Crusaders all four times the two corps met (by margins each time of less than one point). Still, all caption placements remained close between the two corps. In Dubuque, IA, the same night, Vanguard Cadets' score was just 0.05 under that of BDB. • Blue Devils B had won 11 shows this year and lost only one out of 15 last year (July 17 to Vanguard Cadets), in addition to a 15-show undefeated season in 2009 and just two losses in 2008. 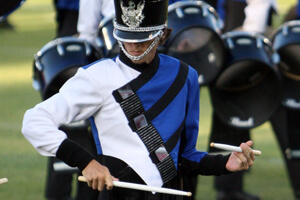 • So far, the Cadets have won 11 shows over Blue Devils, tied once and lost 9 times. After losing to the Cavaliers during the first 8 match-ups, the Cadets won the last 6. The corps has bested Carolina Crown 9 times and lost twice, at the first and third meetings. •After losing to the Cavaliers the first 9 times the corps met, BD has won the last 4. Carolina Crown, having won the first Tour of Champions show over Cadets, BD and the Cavaliers in Saginaw, TX on July 18, and after beating Cadets and BD (but not the Cavaliers) in Minneapolis on July 16, hasn't beaten any of those corps since. • The race to make it into the Finals competition in Indy has intensified. 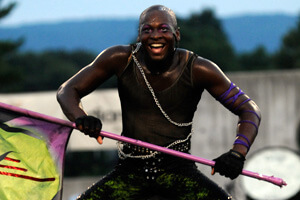 In Allentown, Spirit of Atlanta was 12th, 0.95 over Troopers, 1.40 over Glassmen and 2.20 over the Academy. On Sunday, SOA lost to Glassmen by 1.00 and tied the Academy. Troopers gained just .20 on the corps, but fell behind Glassmen and the Academy, losing to Glassmen for the first time since June 23 (after amassing 10 wins in head-to-head competition) and losing to the Academy after having beaten them in all five prior meetings; once by as much as 3.05. • Bluecoats have beaten Santa Clara Vanguard 7 times this season and lost 6 times, including the two most recent match-ups. (Though the two corps did not compete on the same night in Allentown, the two nights are considered to be one contest.) Phantom Regiment, after scoring 0.90 above SCV in Allentown and 1.35 above Bluecoats, opened the spread in East Rutherford to 3.15 over SCV and 4.15 over Bluecoats at the final Tour of Champions show of the season. The corps has lost to those other two units only once this season.